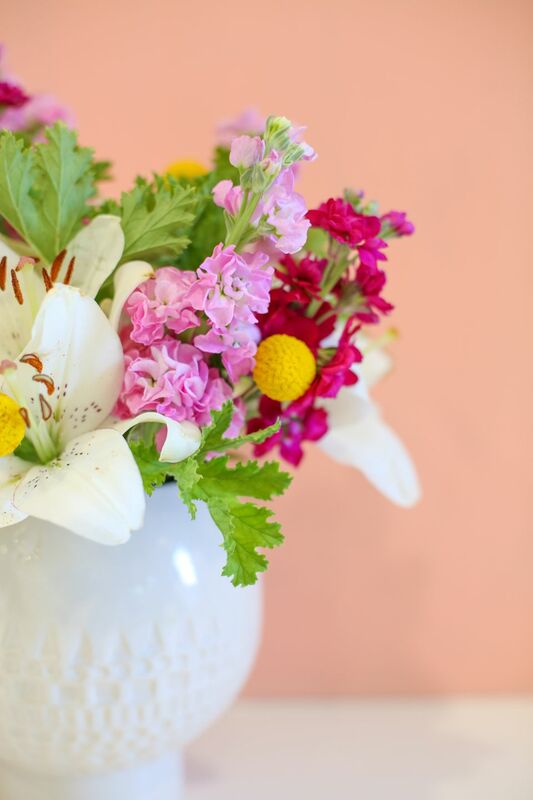 Nothing quite brings a room to life like a beautiful arrangement of fresh flowers. And the best kept secret about floral arrangements is that they don't have to be pricey to be beautiful! With a few simple tricks and a little knowledge tucked up your sleeve, you can make your own gorgeous floral arrangements and keep fresh flowers in your home at all times (at a fraction of the price of getting them from a florist). If you don't know how to arrange flowers, never fear! Read on for a few simple steps and soon you'll be able to create your own arrangements to enjoy over and over. Find some floral stems that you love! A great place to search for flowers is your local grocery store; they're usually inexpensive and you can find a nice selection. Look for flowers that are complementary but have different textures, shapes, sizes, and colors. Choose an overall color palette and then a few contrasting shades to complete it. If your flowers don't have greenery with them, find some greenery stems to fill in your arrangement. Start with a clean vase, free of any debris, dust, or dirt from previous arrangements. Wash or wipe clean and fill half full with fresh, cool water. Tip: Using warm water can coax flower buds open, so if you are trying to open your blooms right away, try warm water. But be aware that this can also cause open flowers to wilt early! When prepping your florals for the arrangement, use your scissors and make a fresh cut on the end of each stem, at a diagonal. This keeps blooms fresh longer, and helps with optimum water intake to keep your arrangement looking great. It's also a good idea to strip the lower stems of any leaves or greenery (take off anything that will fall below the water line). Greenery underneath the waterline tends to get soggy and can contaminate your water, causing flowers to wilt earlier. Also, if a stem is trying to get water to the extra greenery, the bloom at the top can get shortchanged. Removing that greenery helps get maximum water to the bloom itself. Choose a few larger blooms for the focal point of your arrangement. Place these in your vase or vessel, evenly dispersing them on all sides. Once your main flowers are inserted into the vase, start adding accents of varying colors, shapes, and textures. These will usually be flowers that are smaller than your focal flowers. Insert these into your vase, keeping an eye on the shape that the arrangement is taking. Adjust as needed by trimming stems shorter if any flowers need to be nestled down further into the vase. Insert greenery as needed into the arrangement to provide filler and extra color. Adding greenery between blooms can help accentuate the shape and color of your focal flowers by separating them a bit, so use your greenery accordingly. 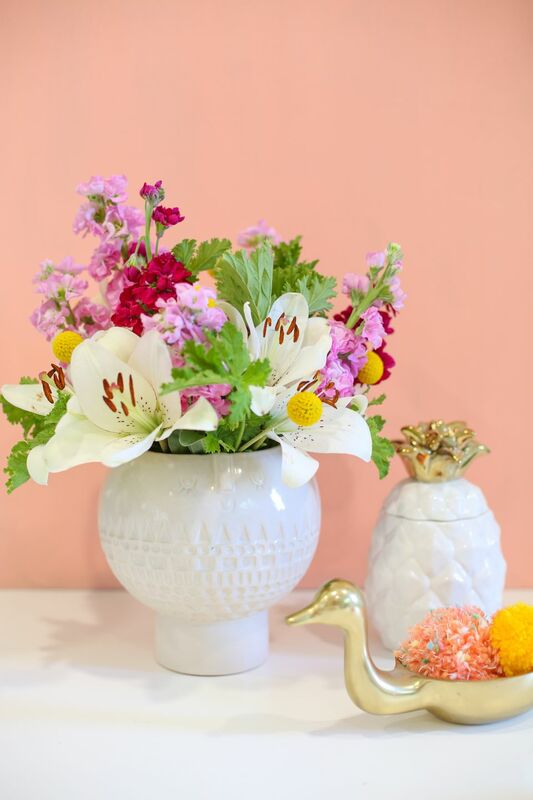 Adding one final touch in the form of an unexpected color or shape can really pull a flower arrangement together! These yellow billy balls are a fun addition and they unify the other shapes and colors already in the arrangement. Use these sparingly; just a few stems will do. To get a little extra life out of your arrangement, change the water daily. Additionally, you could trim the stems again after a few days to freshen them up and help your flowers to keep drinking water efficiently.